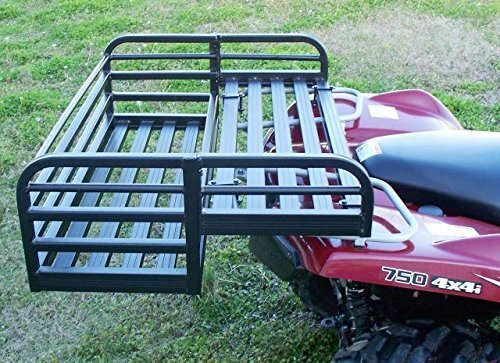 The Great Day mighty-lite deep rack offers ATV owners a means to transport larger items in style. The deep rack features a "drop basket" and measures 40" wide x 29" front-to-back and 13" deep. It is constructed of aircraft aluminum, weighs only 28 lbs. And installs quickly with Great Day unique quick-mount system. The mighty-lite deep rack is ideal for transporting any gear, equipment or materials that do not exceed the manufacturer's stated weight capacity. The deep rack is finished in super-tough black, powder-coat enamel and will never rust. This rack is so tough and durable, it comes with a 5-year warranty. Ships by ups made with pride in the USA.